It is the best part of fifty years since a school careers master told the sixteen-year-old Jon Callan that he wasn’t really suited to the world of work. ‘He was possibly the most perceptive teacher I ever encountered,’ says Jon in the airy kitchen of the Dorchester home that a lifetime of ‘not working’ has afforded him. ‘At first I took him at his word and did anything but work. I lived in a squat in Brixton and periodically ended up back at my parents’ home in Salisbury. 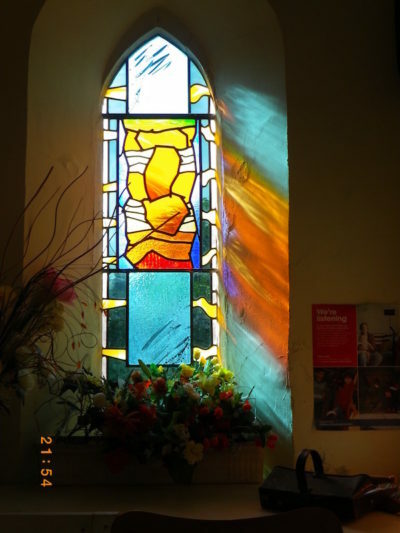 I knew about some workshops at the Cathedral and liked stained glass, so I applied to Swansea Art College, which then had a world-class stained glass department, went for an interview, did a drawing and then pestered the head every day for a fortnight until he let me in. 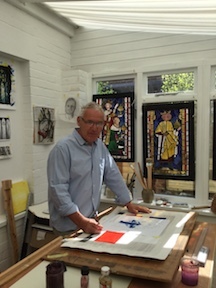 Although Jon has a passion for stained glass and is steeped in its traditions and technicalities, the natural direction of his conversation travels away from the mechanics of what he does. Small wonder, really, as there are tales of trips to Easter Island and Samarkand, white-water rafting in the meltwaters of Everest, tango lessons in Buenos Aires and a recent adventure to Namibia to help construct water supplies to balance the demands of desert elephants and local farmers. Steered back home to Dorset, talk turns to the people he has met and the places he has been in the service of stained glass. There was the church where he volunteered to search a family vault (in vain as it turned out) for a wall plaque memorial to a Georgian slave girl; and another where, after a great deal of negotiation, he obtained the closely guarded ‘secret’ keypad code so that he could come and go with ease, only to discover over the next few days that half the people in town clearly also knew the code. On one job he got to know the four old ladies who looked after the village church well enough to tell them he wouldn’t be coming the following Wednesday as he was bringing his terminally ill then wife home from hospital. ‘On the Tuesday I got a knock at the door and there they were with a cake they’d baked and an offer to clean the house for me. They said they knew I was on my own – even though I wasn’t – and that judging by the mess I left in the church, they thought I could do with a hand tidying up! Negotiating commissions for new pieces can be a tricky business where churches are concerned, but not always. Jon’s design for a Royal Air Force memorial window at Holy Trinity, Warmwell, involves a line drawing of an aeroplane in a repeated stepped pattern with the numbers and badges of the squadrons stationed at RAF Warmwell etched faintly in the glass. ‘The idea is they will be there like memories, ghosts perhaps, or shadows fading from view. The churchwardens I’ve met are on board and I’m greatly encouraged. The diocese will always say that work should be contemporary – it commissions work about today so that tomorrow we will know who we were. I’m not a Victorian and although much of my life is spent surrounded by the Middle Ages or before, I can’t make work from that time either. As ever, he’s open to ideas. First published by Dorset Life The Dorset Magazine.